Choosing between the 12 gauge 3-inch shotgun shell and the 3 1/2–inch shotgun shell for waterfowl has always been a tough dilemma. In this guide, we’ll discuss the differences between 3-inch vs 3 ½-inch shotgun shells, and why you should pick one over the other. 3 ½ inches is greater than 3, right? So why would you waste your time with 3-inch shotgun shells? This is the line of thinking that is repeated the most but it couldn’t be further from the truth. Both 3-inch and 3 ½-inch are capable shotgun shells lengths that work well for the situations they were designed for. The following are the main differences between 3 inch vs 3 ½-inch shotgun shells and which one may work best for you. The 3 ½-inch 12-gauge has seen a number of changes since it was first released by Federal and Mossberg in the late 1980s. The model lineup for both 3 ½-inch shotguns as well as 3 ½-inch ammunition has grown considerably since then. Most of these autoloader guns will cycle 2 ¾-inch shells all the way up 3 ½-inch making for a very versatile shooting platform. Theoretically, the 3 ½-inch shotgun does it all. And while this may seem like an open and shut case, it’s not quite that easy. 3 ½-inch shotgun shells were first designed because of the poor performance of steel shot around the time of the lead shot ban. Cramming more pellets into a large hull was thought to be the answer for added pellet density for larger shot types. Prior to the lead ban, 2 ¾-inch and 3-inch high brass shells were the standard. The 3 1/2-inch 12-gauge was designed specifically to put an increased number of large pellets in an effective pattern for waterfowl. This the reason the 10-gauge had so much popularity as well in the late 1980’s and well into the late 90s. When you compare the 3 ½-inch 12-gauge to the 3 1/2-inch 10-gauge it may seem that they would be exactly similar, but that’s not the case. The 10-gauge has a larger overbored barrel and produces better patterns with large loads of steel shot. Most 3 ½-inch 12-gauges are built on lighter frames and don’t fully take advantage of overbored barrels and weight reduced recoil. Most 3 1/2-inch shotguns are slightly heavier in weight and longer than their 3-inch counterparts. This may be ideal for waterfowlers, especially goose hunters, but not so for upland game hunting or even turkey hunting. With the introduction of new non-toxic shot, the need for 3 ½-inch shotgun shells has dwindled even more. Hevi-shot, Tungsten Super Shot, Bismuth, Heavyweight, and other heavier than steel alloys have reduced the need for the heavy payloads that were needed for steel. Even 2 ¾-inch shotgun shells can be a long range goose load with heavier than lead alternatives. With the capacity concerns no longer an issue, the 3 ½-inch 12 gauge is more of a want than a need. 3-inch shotgun shells perform well on decoying ducks, and even geese for that matter. If you’re shooting large steel shot, the 3 ½-inch is still the way to go though. The 12-gauge 3 ½-inch shotgun is the most versatile platform that works with three different sized shells. It’s always better to have a gun that accepts any mass-produced shell thrown at it. For this reason, the 3 ½-inch 12-gauge will always have a place, even if it’s not ballistically. The 3 ½-inch shotgun shell was designed to pack a large payload of steel shot for added pattern density. The 12-gauge 3 ½-inch shotgun is the most versatile 12-gauge ever produced. Prior to the lead ban in the 1980s, the most popular duck and goose loads were high brass 2 ¾-inch and 3-inch lead loads. 3 ½-inch shotgun shells do not travel further than 3-inch shells given the FPS and pellet type are the same. 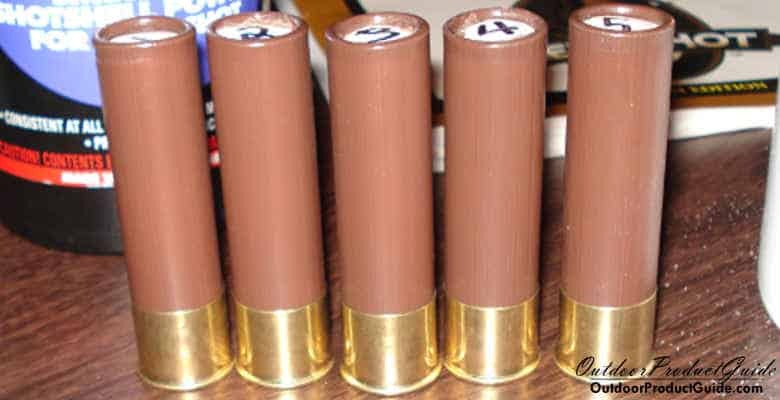 3-inch shotgun shells lack the pellet density that 3 ½-inch shells can provide due to a smaller hull capacity. 3 ½-inch shotguns tend to be built on heavier and longer frames than 3-inch guns. With the introduction of non-toxic steel alternatives such as Hevi-shot, Tungsten Super Shot, Bismuth, and Heavyweight, the superior ballistics of the 3 ½-inch shotgun shell has been diminished greatly. 3 1/2-inch shotgun shells are still better than 3-inch shells in delivering large payloads of steel shot at long ranges. 3-inch shotgun shells can be found considerably cheaper than 3 ½-inch. Want to know how many pellets are in your shotgun loads? Check out our pellet count tables here. Can you shoot 3 inch shells in a 3.5 inch chamber? Yes, 3-inch shotgun shells can be fired in most 3 ½-inch chambers. Shotgun chambers are pressure tested to SAAM specs which are the max pressures that the barrel can withstand. 3 ½-inch 12-gauge barrels have a greater pressure tolerance than barrels designed for 3-inch shells. For this reason, a 3.5-inch chamber is perfectly safe to fire most 3-inch ammunition in. Do 3 ½ inch Shotgun Shells Travel Further? The 3 ½ inch shell is largest shotgun shell you can use to harvest waterfowl legally. There is a 4 inch shell (the 8 gauge), but it isn’t legal to hunt waterfowl with. But does a large shotgun shell always mean added distance? The short answer is no. The 3 inch vs 3 1/2 inch shotgun shell distance does not vary on a pellet by pellets basis. It’s a common misconception that large guns like the 3 ½-inch 10-gauge or 3 ½-inch 12-gauge have extra-long range capabilities but it isn’t true. If the two loads are the same feet per second (FPS) and shot type, it’s theoretically impossible for one to go further than the other consistently. Where the 3 ½-inch 12-gauge does shine at long ranges is the ability to deliver greater pellet density at long ranges increasing its effectiveness. In the field, this can appear that the 3 ½-inch shotgun shell is “traveling further”. The debate between 3 inch vs 3 1/2 inch shotgun shells is one that started back in the late 1980’s when the first 3 ½-inch ammo hit the shelves. The debate is still going on today, but there are some clues recently that indicate the 3 ½-inch shell may be on the way out. The 3 1/2–inch 12-gauge is the most versatile shotgun you can buy, and that alone is the reason you will likely never see it fully phased out. If the added weight and length of the 3 ½-inch platform isn’t an issue, or the price, there’s really no reason not to own one. But if you do decide to pick one up, it’s important to note that you probably won’t be getting the increase in ballistics you think. For starters, the 3 ½-inch shotgun shells really shine with large payloads and pellet sizes. If that’s not your thing, then a 3-inch shell might be better and offer less recoil. With the introduction of heavier than lead alternatives, even 2 ¾-inch shotgun shells can make for viable long distance goose loads past 60 yards. The differences between 3 inch vs 3 1/2 inch shotgun shells are still there, but are they enough to warrant only shooting 3 ½-inch from now on? Most likely not. Need a new waterfowl choke tube? Check out our top picks here.